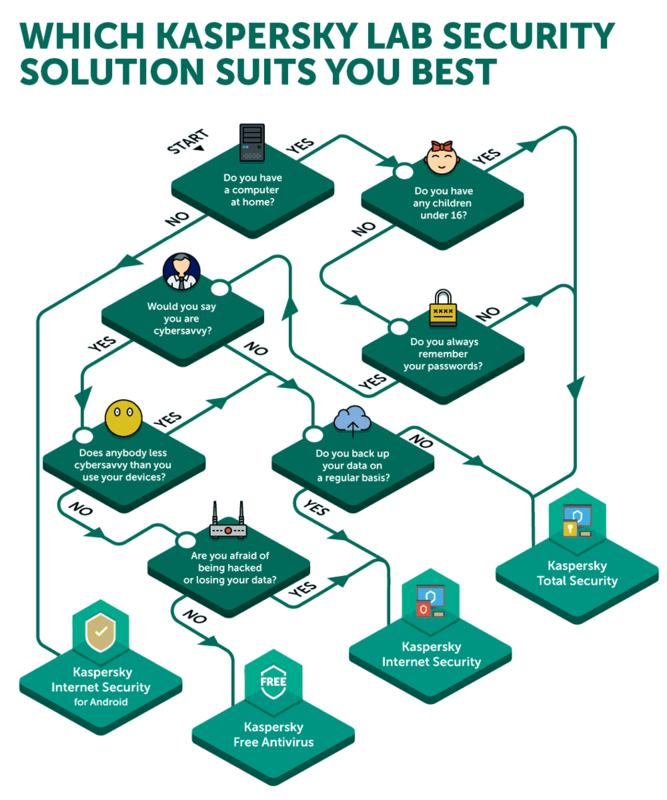 Which protection from Kaspersky Lab is right for you? You might’ve wondered why Kaspersky Lab has so many different products for consumers. On the website, you’ll find Kaspersky Internet Security, Kaspersky Total Security, Kaspersky Free Antivirus, and more. Which one should you choose? Well, it depends, but we can help you here. Different users have different expectations of a security solution, which is why we created a variety of solutions. Here, we provide an infographic guide that will help you choose the protection that is right for you. We hope that helped you choose the right security solution. To download your choice, just click on its icon in the infographic and then install it on the devices you want to protect. If you need some more help in choosing a product, you can go to our website and click “HELP ME CHOOSE” in the upper right corner to go directly to the helping tool. No matter what you’ve chosen, you’ll get a state-of-the-art security solution that provides top-notch protection. They have different features, but all of them have won a lot of awards from different independent testers.